I’m guessing most of you knew this day was coming. I’m sure you all realized that it was just a matter of time before the call would go out to hot rod builders around the globe that it’s finally time to integrate Brannock foot-measuring devices into designs for pedals. The time is now, and I believe the world is ready. I should mention that while I have been an admirer of the strangely-satisfying device since I was a kid, loving the heft of it and the wonderful way sliding that strange-shaped slider thing feels in your fingers, I wasn’t aware that the fundamental units its designed to measure are called barleycorns, a roughly 1/3" unit of measurement specific to shoe sizing until I read this week’s wonderful Tedium newsletter from the amazing Ernie Smith. But we’re here to talk about cars, not barleycorns. 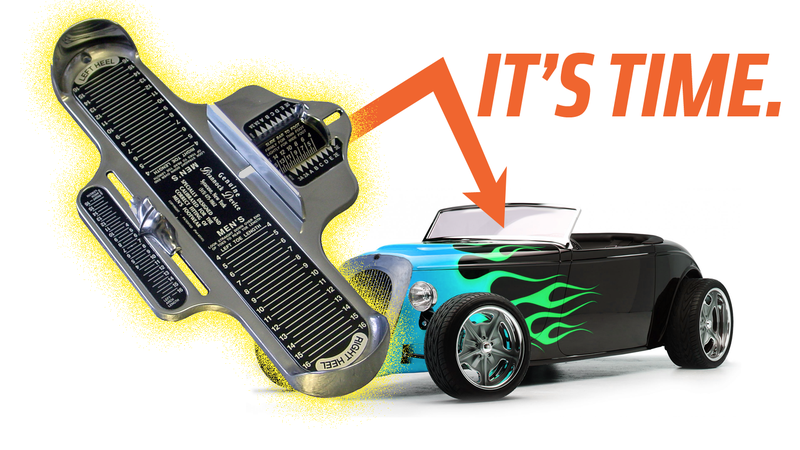 The Brannock Device has been criminally underutilized as a basis for hot rod pedals for decades now, and I intend to see this travesty end. Currently, the state of hot rod pedals isn’t exactly stellar. While there are many hot rods with some interesting, practical, and even visually arresting home-built pedals, far too many rely on the now quite clichéd “foot” pedal, mostly because good, sturdy, pre-made and yet novel pedal options are sadly quite rare. I mean, let’s face it: while there’s certainly a place for the “foot” pedals, they’re pretty goofy and just don’t fit in with every hot rod thematic look. The Brannock Device, however, offers a great option for interesting pedal designs, and has the added benefit of being a solidly-built, all-metal object that can lend itself well to modification, cutting, and welding to be transformed into car pedals. Plus, I bet you could repurpose the little slider and some of the other bits into cool dash controls, or something. Look, they even come in multiple colors! I swear I’m not in the pocket of Big Brannock here, I just believe that a Brannock device would make a fantastic set of pedals for the right hot rod or other home-built car. Get one used for a lot less money, if you don’t want to pump cash into a company that, let’s face it, has a near-monopoly on foot measuring. I don’t care. If anyone has ever seen a car that already uses Brannock Device pedals, please, let me know. And if anyone actually decides to try this, again, let me know, because I’d love to feature your Brannock-controlled build on here. If you only consider one Brannock Device-related thing today, please, I’m asking you, let it be this. I appreciate it.